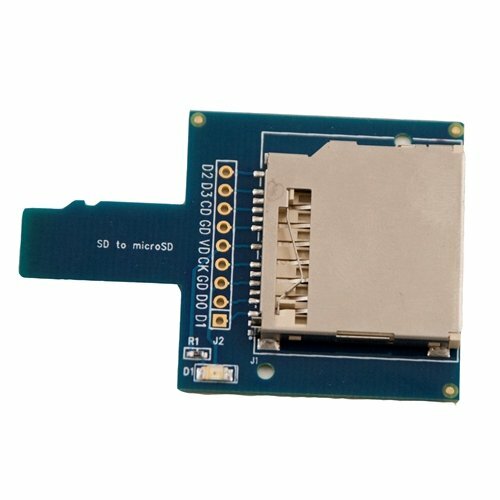 The ST-SD-uSD is an accessory board designed to convert a standard Secure Digital (SD) Memory Card form factor into a Micro-Secure Digital (Micro-SD) form factor. The board allows any item using the SD form factor (such as SD Memory Cards, SD Wireless cards, etc.) to be connected to devices containing a Micro-SD Slot (such as a Table PC, PDA, Phone). The board can also be used to prototype or debug SD signals. A standard 0.1 inch pitch, 9-pin header can be soldered to J2, allowing developers access to the SDIO signals for easy SDIO application prototyping over a Micro-SD Slot. If you have any questions about this product by Saiko Systems, contact us by completing and submitting the form below. If you are looking for a specif part number, please include it with your message.